To be the premier publisher of quick-reference materials, assisting customers worldwide in accomplishing their educational and professional goals. To earn customer loyalty by continually updating our products, ensuring accuracy of information, working together as a team, and adapting to the transitioning publishing market so that our products are always available in whatever format our customers need to succeed. BarCharts was conceived in early 1991 while Bobbie Ford, sitting at her kitchen table, was studying constitutional law for the bar exam, and penciled a flow chart summarizing the pertinent points. She made copies and her law school friends loved them. Her husband, John Ford, saw opportunity. 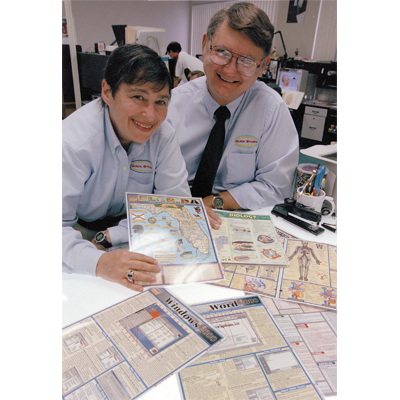 At first, BarCharts was a modest business that created and sold guides dealing with torts and criminal law. 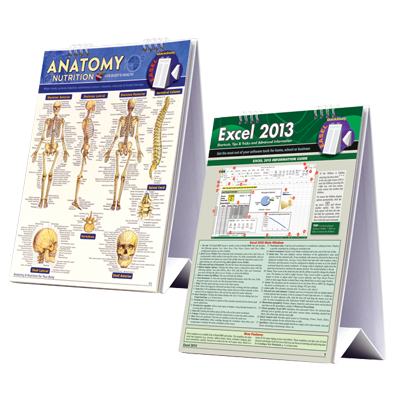 Today, we not only produce over 500 QuickStudy® laminated quick-reference guides, but also offer a range of products that include flash cards, posters, and books. Our products are available in over 15,000 retail locations, as well as online in digital format from industry-leading digital distributors in the publishing marketplace. Click to expand the timeline below to follow our amazing 25-year journey in business! 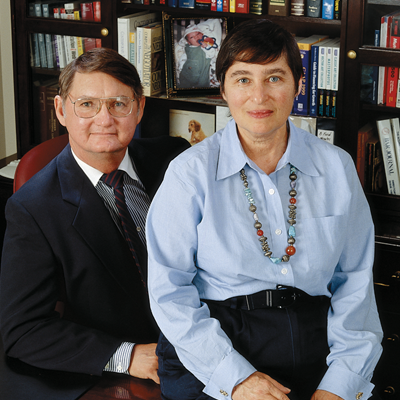 BarCharts, Inc. is founded by the husband-and-wife team of John and Bobbie Ford in Boca Raton, Florida. 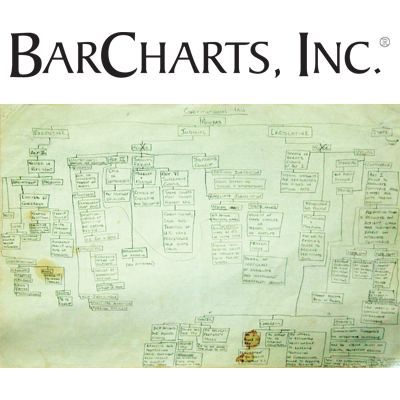 Bobbie is studying for her bar exam when she takes the main ideas/principles of Constitutional Law and creates a diagram in flow-chart format that follows the course. She shows the flow chart to her classmates, and they love it. John takes the idea of flow-chart format course outlines/reference charts and presents it to law school bookstores—the response is overwhelming and BarCharts, Inc. is formed. BarCharts expands product offerings to include not only law titles but undergraduate-level titles as well. An initial group of 13 undergraduate-level academic titles are produced, including: Algebra, American History 1, Biology, Chemistry, and English Grammar & Punctuation—all titles that become perennial best sellers. BarCharts begins to laminate the charts, now referring to them as “quick reference” guides. With the expanded title mix comes increased distribution—no longer just law school bookstores but now all kinds of bookstores. BarCharts also receives a brand name: All reference guides are now officially called QuickStudy®. The company releases its first titles in poster size: Anatomy and Periodic Table: Advanced. 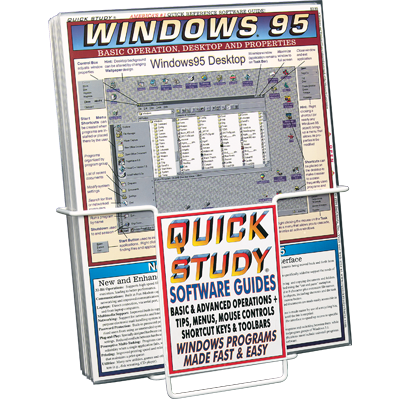 In addition, BarCharts expands into the corporate sector with the release of reference guides for Microsoft Windows 95. 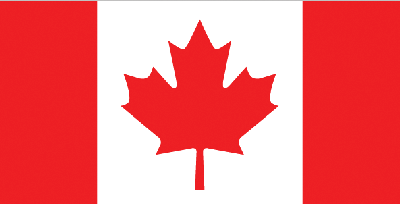 BarCharts has its first international presence with sales in Canada. With the hiring of the first academic sales rep group, the company calls on college and trade bookstores and QuickStudy® explodes into the academic world. BarCharts also expands its presence in the corporate market by developing a foothold in the office supply channel. 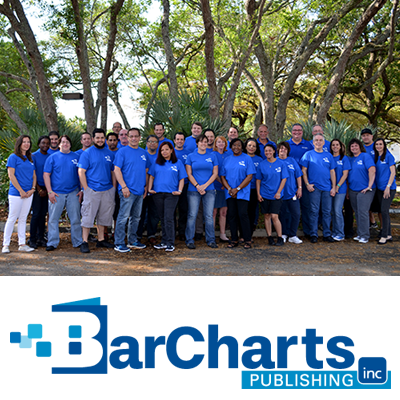 Inc. magazine names BarCharts one of the fastest growing privately held companies in the U.S. The company is also acknowledged by Ernst & Young in its entrepreneur’s consumer product category. BarCharts, Inc. goes global with its first licensing agreement for Latin American distribution (with Grupo Patria Cultural). Expanding its corporate product line, BarCharts reaches beyond its laminated guides and creates the multimedia product QuickTrain™—computer tutorials that train individuals to use 300 software applications. With the release of QuickStudy® flash cards, BarCharts begins producing non-laminated academic products, too. 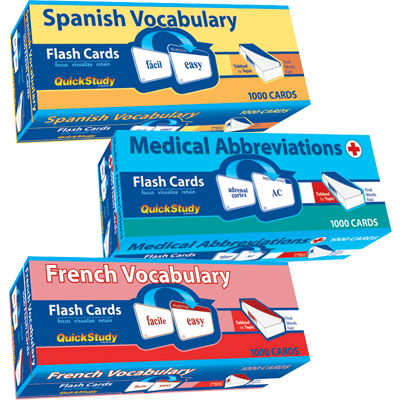 The first flash card line offers: Spanish Vocabulary, French Vocabulary, Medical Abbreviations, and Medical Terminology. BarCharts next develops and produces a line of Nifty Knowledge Fold-Outs™—a combination of information and personalized greeting card, because “knowledge is a gift”. 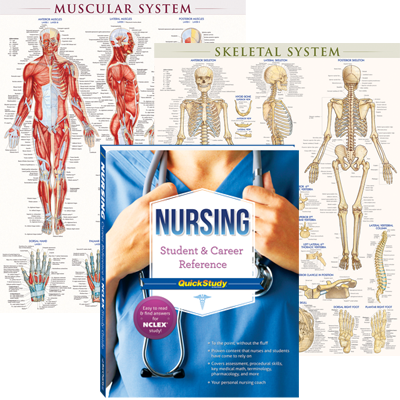 With its ever-expanding offering of new academic products, BarCharts releases its first QuickStudy® Booklets (eight titles) and the QuickStudy® Atlas of Human Anatomy (incorporating 15 body systems in a single, full-color volume). BarCharts expands its offerings of sports titles with a co-branding partnership with Golf Digest, featuring four guides dedicated to golf. BarCharts receives the second place award for best vendors from Mail Boxes Etc. and The UPS Stores. 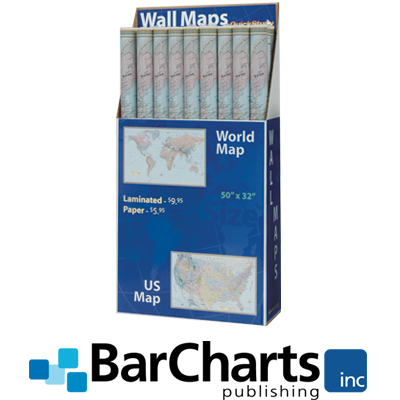 With the release of QuickStudy® Wall Maps (The World and The United States), BarCharts continues its tradition of exceeding customers’ expectations. 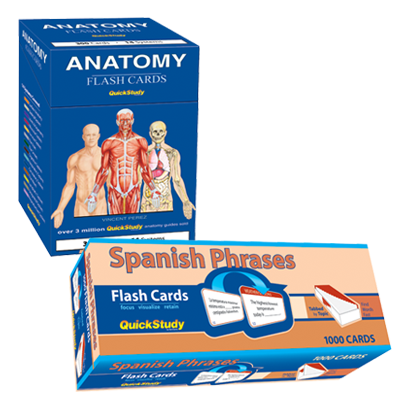 Release of seven new flash card titles, including a beautiful set of anatomy cards, further broadens BarCharts’ academic line. 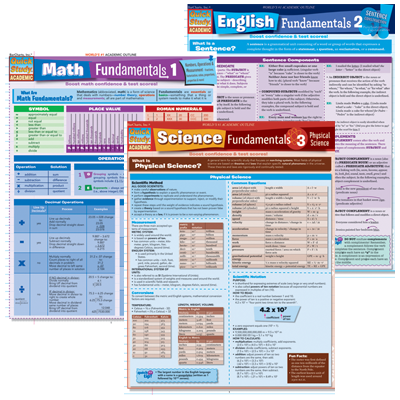 Ten additional “Fundamentals” titles geared toward grades 5 through 8 brings the series to 14 titles in math, English, and science, with future releases in history, reading, and Spanish offered in spring 2010. BarCharts releases 80 titles, making 2010 the year BarCharts releases more titles than ever before! BarCharts turns 20! While some companies are pulling back in this economy, BarCharts is moving forward, full steam ahead, releasing over 70 titles. 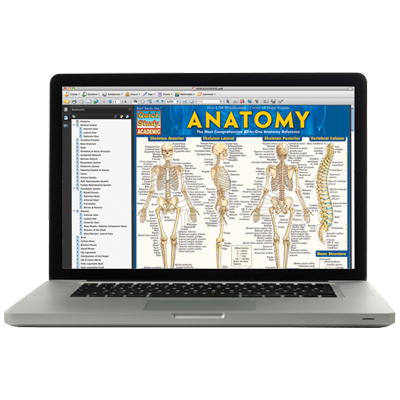 BarCharts continues to expand its QuickStudy® digital offerings with over 75 new titles and adds more digital distributors. VitalSource, Blio, Follett Library Resources, Copia, OverDrive, and Xplana. BarCharts’ best-selling line of medical products continues to grow! 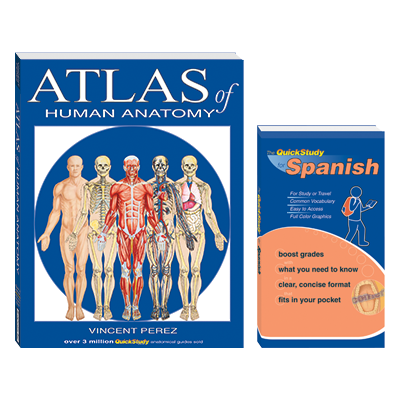 The company is also expanding its anatomical posters to include Muscular, Skeletal, andThe Spine. 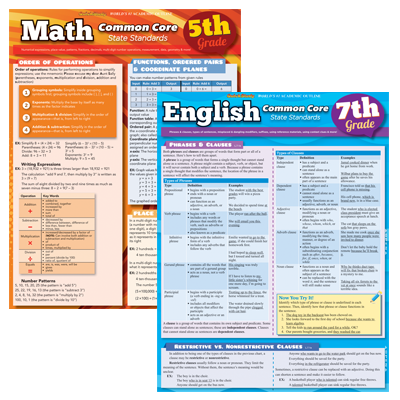 Our new Common Core Laminated Standards series focuses on helping K-12 teachers easily transition their lesson plans in union with Common Core State Standards. 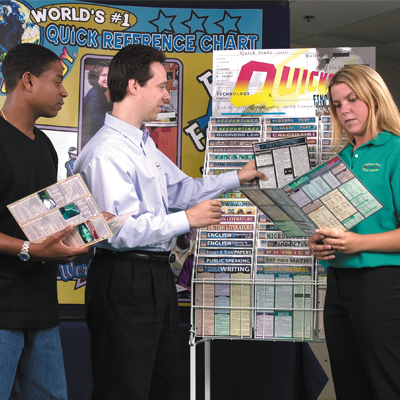 BarCharts releases the QuickStudy® Easel, which offers a hands-free alternative to the QuickStudy® guide. 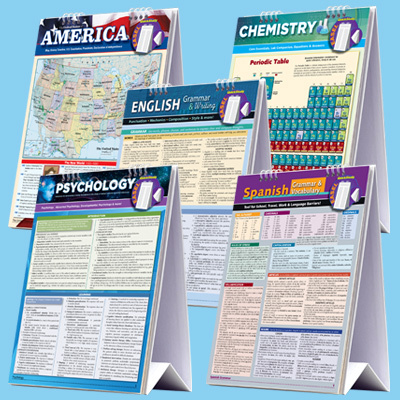 Developed with the busy student or professional in mind, we’ve incorporated some of our best-selling guides into a free-standing easel for effortless reference. 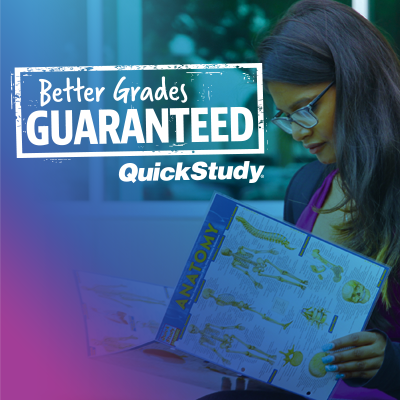 BarCharts launches The QuickStudy® Promise campaign. We guarantee better grades for academic titles, or your money back. BarCharts continues to expand our product lines by adding over 50 new titles. With a newly redesigned company logo, we’re celebrating our 25th year of doing business and helping more people learn quick and learn smart. BarCharts releases four more Easels to expand our offering to nine titles. 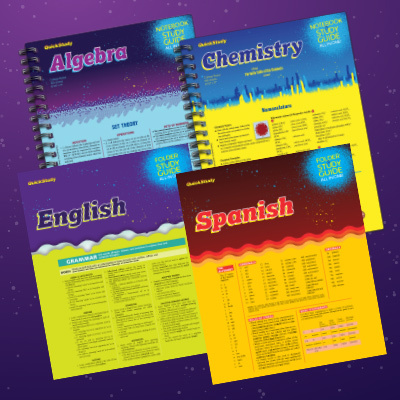 BarCharts is proud to introduce a new format for studying—QuickStudy® Notebooks & Folders. 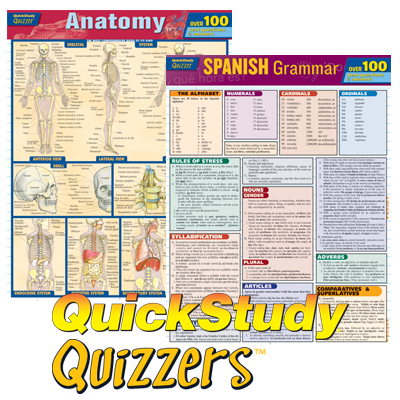 Offering the same great QuickStudy content, now you can take notes for class and find answers in a snap! 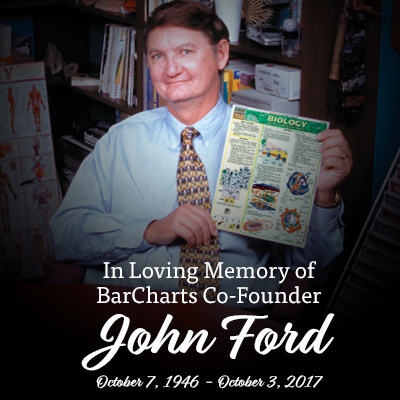 John Ford, co-founder of BarCharts Publishing, sadly leaves the Earth for his bold new adventure in heaven. We will miss him greatly. BarCharts continues to work closely with other organizations to bring the most up-to-date information to the people who need it the most. These organizations help keep you informed about our new products and services, and, at the same time, help keep us “in the know” about what you want. Click on each image to learn more about the associations. Here at BarCharts, we take pride in giving back to the community. Not only do we donate charts to troops overseas, we also contribute to the charities listed below. Click on the images to learn more about these associations.